San Marino senior QB Carson Glazier is putting up dazzling numbers for the 5-0 Titans, who are up to No. 2 in the Central Division rankings. 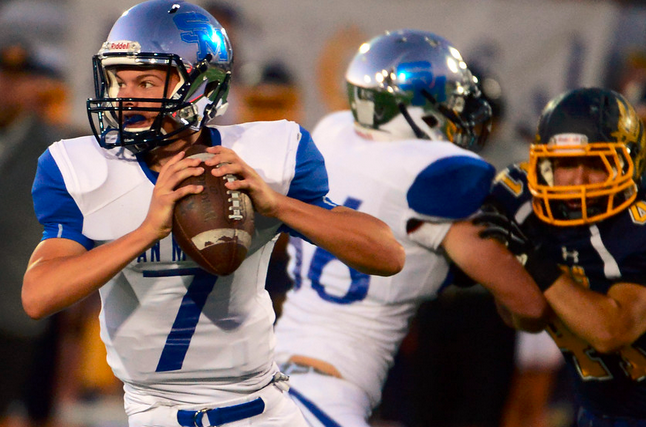 Glazier leads the Southern Section in passing yards with 1,736. He is tied for the Southern Section lead in touchdown passes with 24. If you haven’t seen him play, I suggest you do! 1. Bishop Amat (4-1) — Good and getting better. 2. St. Francis (4-0) — Big test looms vs. Calabasas. 3. La Habra (4-1) — Where’d this defense come from? 4. Charter Oak (4-1) — Resounding win over Glendora. 5. Glendora (3-1) — Shocking stall vs. CO.
6. La Serna (3-2) — Roughed up by Rancho. 7. La Mirada (2-3) — Smooth sailing til playoffs. 8. Bonita (5-0) — What a nonleague campaign. 9. San Marino (5-0) — Opponents’ record = 7-14. 10. West Covina (2-3) — Stepped down and won. 11. Montebello (4-1) — Bubble burst in Paraclete loss. 12. Diamond Ranch (4-1) — Defense is scary good now. 13. Northview (4-1) — Offense is about to get real good. 14. Monrovia (3-2) — Defense came alive in Los Altos win. 15. Los Altos (3-2) — Heading the wrong way. 16. Diamond Bar (4-1) — Can Brahmas factor in league? 17. La Salle (4-1) — Two weeks to prep for Cathedral. 18. St. Paul (3-2) — Waxed by JSerra. 19. San Dimas (2-2) — Special teams woes hurt Saints bad. 20. South Pasadena (4-0) — Confidence growing weekly. 21. Pioneer (5-0) — Outstanding nonleague performance. 22. Damien (2-2) — Got well against South Hills. 23. Arcadia (2-2) — Find out more vs. PHS. 24. Whittier (2-2) — Will they factor in Del Rio? 25. Pasadena (3-1) — Huge test looms vs. Arcadia. His picture stared back at me from the moment it arrived in my email inbox. Just minutes earlier, I asked for a photo of Charles “Bud” Reich to go with the story about his death that I was going to write. Charter Oak High School football head coach Lou Farrar obliged, and there he was a click later, Coach Reich, smiling at me while I cried at him. I summed Coach Reich up as both of those things in my mind when I first met him, somewhat on accident, following a Charter Oak basketball game during my first year on the prep sports beat. According to the roster I had printed from the MaxPreps website, Charter Oak’s head coach was Randy Thatcher. And watching the game, that’s who I thought Reich was because he sure seemed the part of head coach. Reich later explained to me that he was once the head coach and was now helping out his good friend Thatcher, who took a more calm approach during games. Reich certainly looked and acted the part of someone in charge. God knew exactly what he was doing when he drafted up Reich, a coach if you ever saw one. Heck, during Charter Oak’s football game against Los Alamitos in 2012, a cable television company broadcasting the game often showed Reich pacing the Charter Oak sideline as if he were the head coach. It was a moment that I used to bring up often to Reich. We’d laugh about it. But those days are gone now. Reich’s long battle with cancer came to a close last weekend. The man who fought through sickness and pain so often just to make it to practice or a game, is now gone. I don’t pretend to have known Reich as well as others. Far from it. He surely touched the lives of his former players and fellow coaches and his family way more than mine. And that’s as it should be. For many people, myself included, Reich represented the old school. From his straight out of central casting looks to his coaching style to the way his teams played defense to his gentlemanly disposition, Reich was part of what’s fast becoming a bygone era. If you’re reading this, you probably had a coach like him, too, somewhere along the way. Reich knew when to yell and when to console. He knew how to filter his own competitiveness into his players and reap the rewards. He knew the importance of wins and how to get them. He also knew how to handle losses and put them in context. So why all the tears? It took the better part of the week to figure that question out. Like anyone who we admired that has passed, there’s sadness. But this is about more than that. Reich smiles back at me in his picture because he knows he did it right. Not perfect. Not without mistakes. But right. I cry because deep down I know Reich was a relic. I compare generations, mine versus his, and he smiles while I cry. They don’t make ‘em like him anymore. That’s cliche but it’s also fair warning. 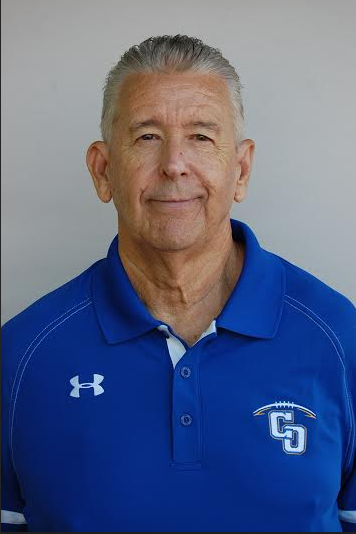 Former Charter oak High School boys varsity basketball head coach and more recently varsity football assistant coach Charles “Bud” Reich passed away at his home Sunday evening after a long battle with cancer. He was 72. Reich was head coach of the Charter Oak basketball team for 19 years and took his team to the CIF championship game in 1986, the first year that the school had combined with Royal Oak. He served as an assistant coach from 2000-07 under former Chargers head coach Randy Thatcher. Reich and Thatcher resigned following the 2007 season after Reich’s son Tyler, a standout point guard, concluded his high school career. “He was sick the whole time I knew him,” Thatcher said. “He had so many countless surgeries but he never showed it. He was a good looking man and stayed in great shape. There were times he gave me a great two hours at practice and there were times we had to carry him to the car. In recent years, Reich was a member of Lou Farrar’s varsity football staff. Despite being released from the hospital late last week, Reich insisted he attend Charter Oak’s game last Friday at Bell Gardens. He did just that and saw his beloved Chargers win one last time. Reich was born in Pueblo, Colorado in 1943 and moved to Southern California with his family before elementary school. He was a standout point guard at Duarte High and later played at Mt. San Antonio College and Cal Poly Pomona, where he led the country in free throw percentage during one of his seasons. As a coach, Reich was known for his tough, old school style. But his teams played ferocious defense and often made up for whatever size limitations they had with tenacity. He was also a devout Alabama football fan as he had family ties to the state. “He’d yell and growl at a kid and by the end of practice he’d have his arm around him,” Thatcher said. “A lot of the kids here now didn’t know him that well, but they’re mourning because they felt a kindred spirit with him. The seniors (football player) just look at me in class and shake their heads and say they’re sorry. I know they had to council with some of the football kids. Aram’s Take: I met Coach Reich in the mid-2000s. He was serving as an assistant coach to then Charter Oak boys varsity basketball head coach Randy Thatcher. Reich was able to coach his son Tyler during those years, which was very important to him. Reich was always a class act and in recent years he and I would always talk for a few minutes before Charter Oak football games. I would often joke with him about the time that a cable television station covering the Los Alamitos-Charter Oak game a few years misidentified Reich as Lou Farrar and was following him along the sidelines as if he were the head coach. He did look the part. He was always great to me. Very sad to know a fixture won’t be there anymore.